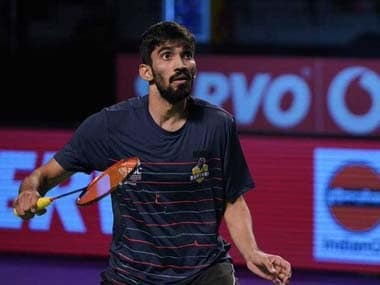 Bengaluru: The unbeaten Kidambi Srikanth combined with Sai Praneeth to guide Bengaluru Raptors to a win over Awadhe Warriors in the first semi-final of the Premier Badminton League on Friday. With the two teams tied at 2-2 on completion of the two men's singles and mixed doubles rubbers, it was left to the Raptors' Trump pair of Hendra Setiawan and Mohammad Ahsan to deliver the win for their team, and they duly obliged. The Bengaluru team will hope to erase their setback from the previous season in which they lost the final narrowly to the Hyderabad Hunters. Srikanth had accounted for the former World No 1 Son Wan Ho twice on his way to winning four Superseries titles in an incredible 2017 season. Showing every bit of that hunger and determination, the Bengaluru skipper blew away the Awadhe icon player 15-7, 15-10. The win enabled him to remain unbeaten in seven matches this season. Srikanth's smashes absolutely ruled the court and he even displayed his finesse in a superb 22-shot rally to go up to 10-4. If the Awadhe shuttler hoped to see his opponent relent in his intensity, he was disappointed. The Bengaluru shuttler was thoroughly in charge of the second game as well, finishing the win after going up 11-6. Former world champions Hendra Setiawan and Mohammad Ahsan lost their last league match on Thursday but the erstwhile No. 1 pair showed how to lift their game under pressure. Showing nerves of steel in the first game, the Raptors pair staved off a brilliant fightback from Awadhe's Yang Lee and Christiansen on golden point. In the second game, Setiawan's delicate dropshots did the trick as the pair inched ahead to 11-4 and soon wrapped up the 15-14, 15-9 win much to the delight of the home crowd. Sai Praneeth had a 1-2 head-to-head record against Lee Dong Keun in the BWF circuit. But the Bengaluru shuttler simply pushed it out of his mind to grab a 15-9, 15-4 victory. The former Singapore Open has been sensational this season, as validated by his wins over Sameer Verma and HS Prannoy. And he continued his immaculate form once more by giving absolutely no chance to the Korean. From 2-4 down, he raced past Keun to 13-6 by using his attacking shots to perfection. In the second game he built a whopping 12-3 and held on to it to record his sixth victory on the trot. Earlier, the Awadhe rightly chose to award their Trump to their efficient mixed doubles pair of Ashwini Ponnappa and Mathias Christiansen. With Bengaluru's CWG silver medallists Marcus Ellis and Lauren Smith remaining winless so far, they delivered a commanding 15-7, 15-10 win for their team. The Awadhe stamped their authority right from the start by building a hefty lead of 8-2 and only kept adding points steadily from thereon. Christiansen was all over the English pair in the second game, exposing their weakness with his array of smashes and dropshots, and easily fetched the win.